The new product from the Nokia electronics is Nokia Lumia 1020 which is also known as Nokia EOS, This smart phone is powered by Windows 8 software. 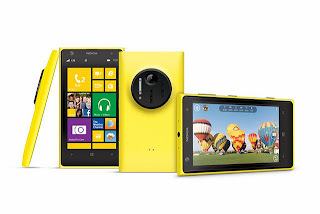 And the Nokia electronics is the first company to launch 41- Mega pixel pure view camera in new Nokia Lumia 1020 . The Nokia's Lumia series phones having growth in Indian market from the past year . The 41- mega pixel camera will give new camera experience to the smart phone lovers. 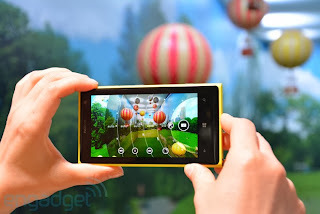 Nokia Lumia 1020 features- The new Nokia Lumia 1020 comes with super sensitive touch display size is 11.43 cm, and resolution is 1280 x 768 and featured with Gorilla glass 3. This the first phone with 41 Mega pixel and supports resolution up-to 7712 x 5360 pixels operate on carl zeiss tessar lens also powered with 6-lens optics, high resolution zoom 3x for video calling and automatic flash and 1.2 mega pixel front camera .The Nokia Lumia 1020 is powered by Windows 8 operating system , with 1.5 GHz Dual-core processor Qualcomm Snapdragon S4 and 2 GB RAM. And storage power is given by Sky Drive cloud storage of 32 GB and expandable upto 64 GB. And battery back-up is much better than the previous phones which is 2000 mAh battery . And the smart phone also supports different document formats like Word, Excel , PDF , Power point, and OneNote . And the phone also comes with wireless charging feature.